This site was previously an operational gas works owned by British Gas Properties, manufacturing town gas between approximately 1822 and 1962, when gas production ceased. The site occupies an area of approximately one hectare and had been historically contaminated with pollutants from the gas work operations. The site investigation data identified PAH’s (Poly Aromatic Hydrocarbons), TPH’s (Total Petroleum Hydrocarbons), Heavy Metals (arsenic, lead, chromium, zinc, copper) and BTEX (Benzene, Toluene, Ethylbenzene, Xylene) contaminants. The site was bounded by a combination of residential and commercial properties and had received planning permission for a residential flat development. 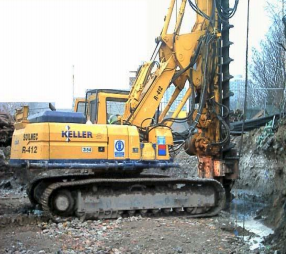 The general principle of the overall remediation works involved the removal of surface contamination (including localised contaminated perched groundwater) and contamination hotspots, to allow the proposed residential development to proceed. In order to prevent the influx of surrounding contamination into the remediated site on completion, a permeable (reactive) and impermeable (containment) barrier (PRB) was required to be constructed around the majority of the site prior to the commencement of the remedial works. On the basis of Environment Agency approval, cost and capability, Envirotreat were commissioned to design and implement a suitable barrier option. The containment barrier was installed around the periphery of the site prior to the contaminated material on the site being excavated and replaced with clean infill material. This was undertaken prior to commencement of the major aspects of the remedial works. This ensured that contaminants which existed on adjacent areas to the site were unable to migrate onto the site. The barrier comprised of soil mixed columns containing E-clays® which were installed along the north western, western and south eastern boundaries of the site. The passive sections (interleaved between active sections) are designed to intercept and deflect some of the ground water flow around the site, whilst the active sections were designed to be permeable to allow some ground water to pass through the site, minimising the overall impact of the barrier system on the local hydraulic regime. The E-clays used in the active sections were specifically designed to chemically immobilise the contaminants of concern in the groundwater passing through the site. See figure 4 for a schematic diagram of the barrier system. The barrier was installed using conventional piling techniques incorporating advanced soil mixing technology. The barrier was up to 7m deep and about 1.5m wide.